Welcome to The Fourth Wall, CHIRP's weekly e-conversation on cinema. 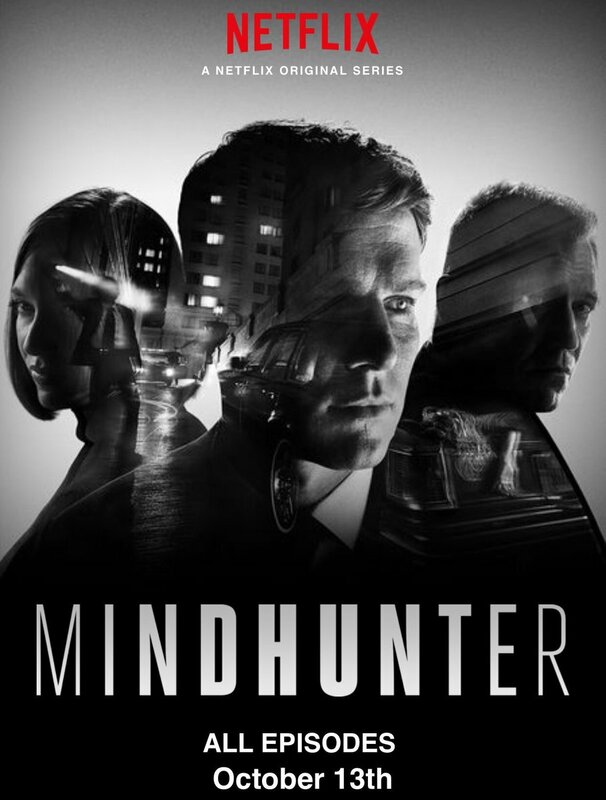 This week's subject is the Netflix series Mindhunter. While delving into the first few episodes of Netflix's Mindhunter, I couldn't help but think about how much more I'd enjoy the crime series if Bunk and McNulty from The Wire were working these murder cases instead of FBI agents Holden Ford (Jonathan Groff) and Bill Tench (Holt McCallany). Or gimme Columbo, rumpled trenchcoat and all? As it turns out, Mindhunter prompted a trip down memory lane with regards to the genre... usually via comparisons not to its benefit. It's clear that -- at least to Hollywood -- FBI folks are wound just a bit tighter than your typical big-city homicide detectives. And much more humorless. I loved The Silence of the Lambs, but Jodie Foster's Clarice Starling was a no-nonsense investigator who wasn't exactly dripping with personality. And neither are Ford and Tench, who slip into time-worn tropes early on: Ford as the wide-eyed, young idealist, and Tench as the world-weary veteran. The two are partners in the late 1970s, traveling the country and teaching crimefighting techniques to local law-enforcement agencies. Early on, Ford develops a fascination with what's deemed as a new, sinister brand of criminal: the serial killer, whose motives aren't related to revenge or personal gain. Soon, Dr. Wendy Carr (Anna Torv), a psychology professor, joins the duo, and the game is afoot. Along the way, Ford interviews a series of imprisoned murderers in an effort to "get inside their heads" and provide some insight for help in catching future killers. Certainly, SotL doesn't have a monopoly on this concept with Anthony Hopkins' Hannibal Lecter. But it's impossible not to draw comparisons, and practically everyone will come up short when measured against Lecter, an iconic character in crime cinema. However, a more interesting pair of detectives could've still made it work? David Fincher is a primary producer/director for the show, and naturally one thinks back to Seven, the 1995 crime thriller starring Morgan Freeman and Brad Pitt as detectives on the hunt for a serial killer. If Mindhunter had featured Freeman interviewing a succession of murderers, I'm watching. Groff's Holden Ford? I'm not. The series, along with Goff's performance, has received a considerable amount of praise, but Ford just comes across as way too earnest for my liking. Like the Tracy Flick of detectives. And the Meet Cute that was tossed in about 10 minutes into the pilot (presumably to make Ford a bit less one-dimensional by giving him a love interest) merely ratcheted up my antipathy. We covered the documentary The Thin Blue Line a couple of weeks ago; I'd much rather watch a documentary on the BTK Killer (shaping up to be the Big Bad of the series) than follow this trio on the trail. I know I'm certainly in the minority here, though! What did you think, Clarence? No doubt, this has been one of the more frustrating viewings we’ve done. If anything, this series shows the limits of using a Fincher-eqsue visual style in a long-form series. When Fincher himself is at the controls (he directed the first two and last two episodes), the monochromatic murkiness works (probably because he does a lot of medium shots and close-ups). We he’s not, it feels like driving through mud. All three of the leads are capable actors struggling with dialogue style that’s straight out of Dragnet (e.g. everyone talks in complete sentences and says exactly what they mean). It’s a stilted approach that may work for a 2-hour movie, but not so much for a 10-part series. I very much wanted to fast-forward past all of scenes dealing with these characters’ personal lives. Holden’s girlfriend, in particular, is one of the worst-written characters of the Netflix era. I have no idea why those two are together. I was kind of hoping she would end up being a serial killer – at least she would have a purpose for being there. I also have to mention the ‘70s song choices which, while appropriate to the era, were clunky and obvious. Vince Gilligan and his Breaking Bad team set a very high bar when it comes to crafting music cues and montages for Golden Age TV. By comparison, the work in this series doesn’t come close. HOWEVER...Where the show shines is during the meetings with the serial killers. The dialogue is based on transcripts from real-life interviews. An important point these meetings show is that, generally, serial killers are not Hannibal Lecter: they are awkward, inarticulate, boring people who don’t stand out until they start doing horrific things to others. The ways the cops get these men to talk, and what those men talk about, is fascinating to me. Overall, I think this series would have been much better as a documentary. Then it would hold more authority, and forego the “based on a true story” cheat code that lets writers change things up at will in the name of entertainment. Season 2 has already been greenlit. For all this show’s flaws, I think I’m on board for more. How about you? And has the core narrative changed your perception of serial killers? Are they born or made? And what would you do about an elementary school principal who hasn’t committed a crime but likes to give students nickels to tickle their feet? Re: Holden's girlfriend -- you mean, you're surprised that a confident, feminist graduate student would hitch her wagon to a socially-awkward G-Man? Hard to fathom why! And do these sorts of pairings ever exist outside of Hollywood? We might need to draw up a list of "Most Unlikely On-Screen Romances" for a future discussion. I'm not on board for any more of Mindhunter. I wonder if this is partly a result of the plethora of options out there these days? If a series doesn't completely grab me, I'm going to take my chances with something else. As to whether my perceptions of serial killers have changed... well, I've already read a fair number of books about crime, so I don't know that this show has moved the needle much. In fact, I'm reading one at the moment by the aforementioned Mr. James: The Man on the Train, about a serial killer in the early 1900s. Like anything else, I imagine criminal tendencies involve a spectrum of behavior. There are some folks who are going to wind up in jail (if society is lucky) no matter what sort of upbringing they have, though nature and nurture are probably linked somewhat? If someone has the genetic material for antisocial behavior, it's a good bet that they're going to have a hard time raising their kids properly. As far as that Tickling Principal, seen in episode 8 of the series? I'd say you hit them with as much as the book allows under "inappropriate contact with minors" that stops short of actual sexual contact. At the very least, the culprit should lose their job, right? And find a different profession. A related question: what do you do about a child who clearly shows psychotic tendencies? (Did you ever see We Need to Talk About Kevin?) As in, it's only a matter of time before this person hurts someone. I am far less versed in the various serial killer stories you cite, Kevin, but I am a fan of Silence of the Lambs. I think Lecter's character was written in a way where he was not only a sadistic animal, but also the smartest guy in the room - educated, cultured, and almost clairvoyant in his ability to perceive and judge other people. He's as much a Mad Scientist as a cannibal killer, which appeals to different aspects of audiences' morality, while also confirming stereotypes that equate intelligence with evil. The other killer in that film, Buffalo Bill, was a lot less interesting in comparison, but probably closer to the "truth" about how criminals like that think and behave. One of the topics Mindhunter seemed to be approaching by the end of the series was the question of whether its possible to predict violent criminal behavior, and if so, what do we as a society do about it? The ultimate end game of a Minority Report-like world where police have "pre-cog" specialists still seems a long way off, but federal and state police acquire more profile data each year. It seems that over the past few decades, the focus has shifted from serial killers to mass murderers, due to the constant string of shooting massacres. The motivations behind those two kinds of crimes may have some similarities, or not - that would be interesting to explore further. In the meantime, we have to rely on the clues in front of us to help detect who may be a threat. In the case of the principal, modern school rules are quite clear: beyond the occasional high five, don't touch the kids, period. Many districts (like Chicago Public Schools) have guidelines that adults shouldn't even be alone with a child at any time without someone else present. The fact that the principal in Mindhunter insists on still behaving a certain way despite requests from numerous people to stop suggests there might be a problem. It's also more than adequate grounds to fire him, too, which they did. I'd be interested to see if this plot thread goes anywhere. Maybe they can find a way to work in Holden's girlfriend so she has more to do? You're right, Hollywood has strange ideas about what couples should go together. Most of the real-life ones I know have plenty in common, as opposed to the glaring differences many fictional couples have. I wonder if, ultimately, the demands of making product has hurt this series. Netflix, Hulu, and Amazon are in an arms race for eyeballs, and they all have a lot of shows in production. I'm hoping with the next season of Mindhunter, the creators will have a chance to catch their breath and look closely at what's not working. The aspects of the show that do work are having a hard time being seen in the shadow of the things that don't. Share December 15, 2017 • http://chrp.at/1qdf • Share on Facebook • Tweet This!